Police use a fire hose to disperse demonstrators at a protest in Bavet this morning, where thousands of garment workers are striking to demand an increase to the minimum wage. 20 Dec – A large group of striking garment workers has been arrested in the Svay Rieng province town of Bavet, officials and rights groups confirmed, during a day of protests that has seen water cannons used to disperse crowds. Ros Tharith, provincial administration director, said authorities intercepted a “small number” of workers this morning who were supposedly carrying rocks that they were going to use to pelt a factory in the Manhattan Special Economic Zone. “They wanted to incite other workers to come out,” he said. But while there is no official tally of the number of those arrested yet, Nouth Bopinnaroath, provincial coordinator for rights group Licadho, estimated that more than 30 male and female workers were arrested. Photos uploaded to local media and Facebook showed police dispersing strikers with water cannons. Chea Oddom, provincial representative of the Cambodian Union for the Movement of Workers, said three trucks were loaded with arrested workers this morning. He estimated that some 8,000 workers were on strike today, down from a reported 30,000 last week. The strikes began last Wednesday after workers demanded a $20 raise to the current minimum wage of $128, $8 more than the $140 figure mandated by the government in early October. Violence was soon reported after factories were pelted by stones and had their doors broken down. Four garment workers were already arrested on Friday and charged with damages, violence and incitement on Sunday. 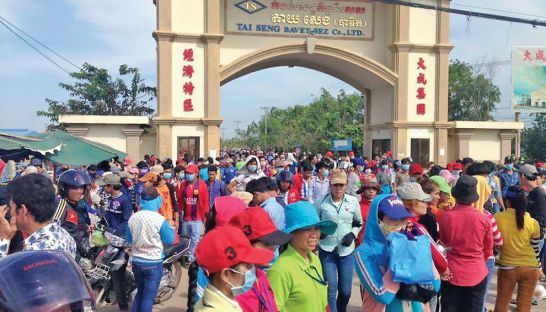 Garment workers pour out of the Tai Seng Bavet SEZ earlier this week in Svay Rieng province during a large protest, calling for a higher minimum wage for the industry. 18 Dec – An unruly protest in Svay Rieng province’s Bavet town entered its second day yesterday as thousands of garment workers from a number of special economic zones continued to throw stones and break windows as they demonstrated for a greater increase to the national garment industry minimum wage. According to Has Bunthy, director of the Svay Rieng provincial labour department, 30,000 workers from 39 factories in the Manhattan, Tai Seng 1 and Tai Seng 2 Special Economic Zones (SEZ) walked out on Wednesday afternoon following a meeting with Ministry of Labour representatives to discuss next year’s minimum wage hike to $140 a month, an amount the workers said was too low. Protesters are demanding a $20 increase from the current minimum wage, or $148 a month, Bunthy and others at the scene said. Though a greater number of police were deployed to the area yesterday, “it looked like they didn’t dare crack down out of fear of repeating the case of Chhouk Bandith”, Bunthy said, referring to the former Bavet town governor who shot three garment workers during a protest in 2012. “Also, no union has claimed leadership of the protests,” he added. Sok Khemara, a local representative of the Collective Union of Movement of Workers, confirmed yesterday that no union was responsible for the protest. While the protesting workers were answerable for the damage, he said, local officials also had to accept a share of the guilt for keeping unions out of the SEZs, preventing them from educating workers about the minimum wage when it was first settled months ago. At Kingmaker, the factory where the protest began, Khemara said, workers had no knowledge of the new wage before Wednesday’s meeting. A factory worker at the Best Way factory, who spoke on condition of anonymity, said yesterday that “a lot of the factory workers broke through the factory’s door and came in to ask me and the other workers to come out and join the demonstration”. Though the worker declined to participate, he said he too was unhappy with the new wage, and supported protesters’ demands that it be raised to $148. Bunthy, the provincial labour official, said factories wouldn’t agree to a higher wage, and that all officials could do was try to sell workers on $140 a month. The Garment Manufacturers Association of Cambodia yesterday issued an open letter to Prime Minister Hun Sen characterising the protests as a “riot”, and calling on the authorities to restore order. 13 Nov – The Transport Workers’ Union has said it is planning further rallies and store sit-ins after 10 truck drivers and union activists were arrested yesterday during a peaceful demonstration at a Coles store in Parramatta. The protest was one of several rallies held around Australia ahead of the annual general meeting of Coles’ parent company Wesfarmers. Protesters highlighted the 330 deaths in truck-related crashes each year because of the pressure by wealthy retailers. Coles’ low cost contracts are forcing truck drivers to speed, drive long hours with over-loaded vehicles. 2 Nov – On Sunday, at around 10:35 local time, two men on a motorcycle drove up in front of one of Go-Jek’s offices in South Jakarta and shattered a window by throwing an object, or by firing a shot at the building. The office was empty at the time. No one was hurt, and the two suspects were able to escape. In case you don’t live in Indonesia, Go-Jek is an on-demand “Uber for motorcycles” app that lets users book rides and other services like food delivery and parcel transport at the click of a button. Go-Jek was not available for comment, though the firm did publish a note on its Facebook page about the incident. We would like to assure you that the incident is being handled by the responsible authorities and that all of Go-Jek’s facilities are equipped with CCTV cameras […] No one was hurt in the incident […] We have not found bullets at the location, only a part of a screw driver which is thought to have been used by the suspect. Before the CCTV footage became available, the items collected at the scene led police to assume that the weapon used was homemade, and that the tip of the screwdriver was used as the projectile. The suspects fired only a single shot, police concluded. CCTV footage obtained by the police later seems to suggest the projectile was not fired at all, but hurled at the window by hand. 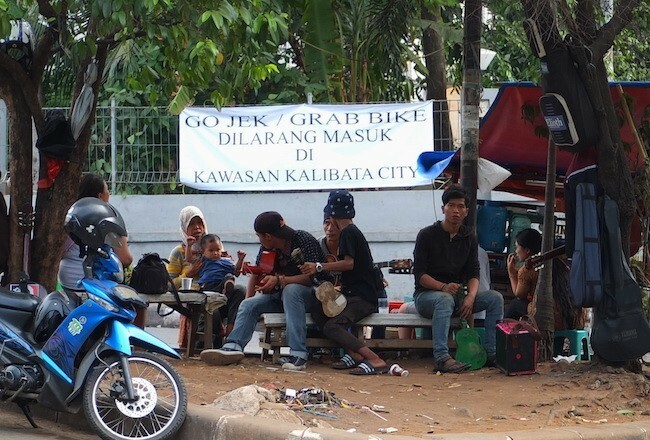 Go-Jek and similar motorcycle services have become popular in Indonesia’s capital, leading them to recruit thousands of new drivers throughout the year. However, some groups of informal motorcycle taxi drivers (called ojek) have not reacted well to the emergence of app-based services. Ojeks have traditionally been the ones to perform these kinds of jobs, without being part of a regulated system. Many of these informal service providers see companies like Go-Jek as a threat to their income and livelihoods. Past clashes now lead many to speculate that the simmering conflict between informal ojek drivers and Go-Jek might be the cause for this act of vandalism. 10 June: Several people were injured when irate Indonesian expatriate workers set fire to a part of their Consulate in the Saudi Red Sea port city of Jeddah on Sunday, apparently frustrated over the delay in processing their applications to make their stay in the Kingdom legal, Arab media reported quoting officials. Firefighters brought the blaze under control before spreading to the Consulate’s main building. Unconfirmed reports said one woman was killed in the incident, but police said some people were only injured. The incident followed a stampede on Saturday when Indonesian women stormed the Consulate in which at least three women were seriously injured, while several fainted.